May/June beetles or “Junebugs” (Phyllophaga spp.) are beetles in the family Scarabaeidae. These native insects are common throughout Wisconsin and can often be seen flying near lights or heard hitting window screens on early summer evenings. Twenty-nine species of May/June beetles have been documented in the state, although there are over 200 species known throughout North America. Appearance: Adult May/June beetles are typically ½ to one inch long and vary in color from reddish-brown to almost black. Adults are active after dusk in late May and early June and are attracted to lights at night. These insects are clumsy fliers and often collide with windows and cling to screens. Immature May/June beetles (i.e., larvae or “white grubs”) have distinctly C-shaped, cream-colored bodies with a reddish-brown head and three pairs of legs. Grubs can be up to 1¼ inches long, and live in the soil using their strong mandibles (i.e., mouth parts) to chew on plant roots. Life Cycle: All May/June beetles in Wisconsin have three-year life cycles (except for the widely distributed Phyllophaga tristis which has a two-year life cycle). Adults emerge in late May and early June, and are active in the evening hours. Adults mate, and females burrow into the soil to lay eggs. After hatching from eggs, white grubs feed on plant roots. Over the course of the next two years, larvae pass through three stages (called instars) becoming larger and more destructive with each stage. In the late summer and fall of their third year (or second year in the case of Phyllophaga tristis), larvae begin pupating in the soil. Adults emerge the following spring. In a given location, overlapping generations can occur so that adults will be present every year. In some (but not all) locations, one of the overlapping generations can be notably larger than the others, resulting in a large adult population every three years. Damage: May/June beetles are pests of turfgrass, ornamentals, Christmas trees, cranberries, and certain vegetable and field crops. Adults have been documented to cause foliar damage to ornamental plants, such as oaks and other trees. This type of damage occurs infrequently and tends to be localized in the state. 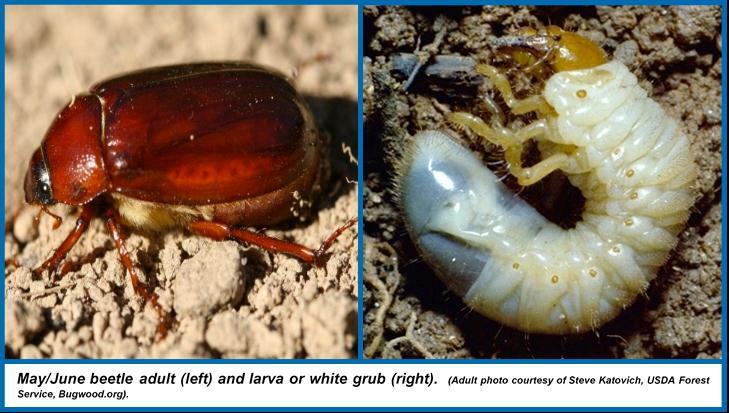 May/June beetle larvae (white grubs) tend to be the most damaging life stage of the insect. White grubs damage plants by feeding on their roots and disrupting the uptake and transport of water and nutrients. Initial symptoms of grub damage appear similar to those of drought stress including yellowing and wilting of foliage, as well as stunting of plants. Grubs can kill small plants, but tend to have less of an effect on larger plants with larger, more robust root systems. When high populations of grubs occur in turfgrass, discolored patches of loosely rooted turf can appear in mid- to late-summer. Animals such as skunks, raccoons, turkeys and sandhill cranes may dig and forage for grubs, causing even more damage to the turf. Damage from adults and white grubs can occur anywhere in Wisconsin, but is most commonly found in the eastern and northeastern parts of the state. Management: Because May/June beetle populations tend to be localized, control is rarely warranted unless there is a history of damage in an area. In locations where damage from a large population has occurred, control may not be warranted every year due to the multi-year life cycle of May/June beetles. Knowing the history of May/June beetle damage in your area and monitoring for these insects can go a long way towards predicting damage and effectively managing this pest. Maintaining plant health and vigor through proper irrigation, fertilization, and other practices can help minimize the impacts of damage from May/June beetles. When chemical insecticides are warranted, a number of contact insecticides will control adult May/June beetles, including: carbaryl, cyfluthrin, lambda-cyhalothrin, and others. If grubs are discovered, contact your local Extension office to properly identify the insect, as other larvae (e.g., Japanese beetle) can occur in turf, ornamental, and crop settings. Proper identification is needed to most effectively manage pests! A number of insecticides are labeled for the control of white grubs. Refer to the following University of Wisconsin Garden Facts and UW-Extension publications for product and timing recommendations: XHT1018 (Grub Control in Home Lawns), XHT1208 (White Grubs on Christmas Trees), A3276 (Cranberry Pest Management in Wisconsin), A3646 (Pest Management in Wisconsin Field Crops), and A3422 (Commercial Vegetable Production in Wisconsin). When targeting grubs with chemical insecticides, be sure to follow all label instructions, which may include applying approximately ¼ inch of water to help move the products into plant root zones.